In each game, there will be at least one Cylon player working against the humans. 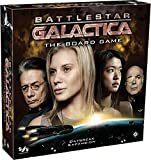 The number of Cylon players varies based upon the number of people playing the game. If at least one resource is depleted to 0 or less at the end of a player's turn, the game immediately ends and the Cylon players win. This is the most common way the Cylons to win. Note that it is possible for the human players to reach 0 of a resource type and then increase it during the same turn without losing the game. 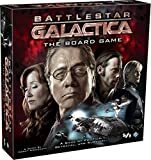 If at least one centurion marker reaches the end of the Boarding Party track, then the crew of the Galactica are killed and the Cylon players win. If six or more locations on Galactica have damage tokens on them at the same time, then Galactica is destroyed and the Cylon players win. Each player starts the game with one Loyalty Card. Later in the game, players receive additional Loyalty Cards, which increase their chances of being Cylon players. p>Loyalty Cards are kept facedown, but their owners may look at them at any time. A player may not look at other players' Loyalty Cards unless specifically allowed to do so by a card or ability. When a player is allowed to look at a single Loyalty Card belonging to a player who has more than one, the card viewed is selected randomly. Each Loyalty Card specifies whether the controlling player is a Cylon, is not a Cylon, or is a Sympathizer. Important: If a player has at least one "You are a Cylon" card, then he is a Cylon player and ignores all "You are not a Cylon" cards that he may have. Once the fleet has traveled at least four distance, each player (including revealed Cylon players) is dealt one card from the top of the Loyalty deck. If a player receives a "You are a Sympathizer" card, then he must immediately reveal and resolve it. If he is a revealed Cylon player, then he may first give the card to any other player (who then immediately resolves it). In addition to human and Cylon players, there may be a Sympathizer inside the fleet. The "You Are a Sympathizer" card represents a human or Cylon who wishes to side with the other team, and is only used in a four or six player game. This card is not added to the Loyalty deck until after the initial Loyalty Cards have been dealt out. A player who receives this card must immediately reveal it. If at least 1 resource is half full or lower (in the red zone), then the player is moved to the "Brig" location. This card is then treated as a "You Are Not a Cylon" card. If every resource is more than half full (not in the red zone), then this player becomes a revealed Cylon player for the remainder of the game and follows the game turn steps described under "Revealed Cylon Players". This player may never activate the "Cylon Fleet" location or play Super Crisis Cards. Carl "Helo" Agathon has two Loyalty Cards, one "You Are a Cylon" card and one "You Are Not a Cylon" card. Since he has at least one "You are a Cylon" card, he is a Cylon player. He may reveal himself on his turn (as an action) to perform the special ability listed on his Loyalty Card. If he does so, he becomes a revealed Cylon player. The player discards down to three Skill Cards. If the player had any Title Cards, they are given to a different player (see "Line of Succession"). The player moves his character token to the "Resurrection Ship" Cylon location. The player receives one random Super Crisis Card. This card remains in his hand and may be played by activating the "Caprica" Cylon location. Super Crisis Cards are treated like normal Crisis Cards, but are immune to all character abilities that affect Crisis Cards. The player's turn then ends, and the current player token is passed to the player on his left. Note that a player who reveals himself as a Cylon does not draw a Crisis Card at the end of this turn, or any of his future turns. Players may accuse each other of being Cylon operatives at any time. Although these blind accusations have no game rule effects, they can help, or confuse, the human players in their hunt to find the Cylons. Should one player gain the ability to look at another player's Loyalty Cards, he may choose to keep this information to himself, share it with the group, or even lie about it. Players are prohibited from revealing the exact strength of cards in their hands. They may use vague terms such as "I can help out on this crisis a little bit", but they may not make more specific statements such as "I am playing 5 piloting". In addition, after a skill check is resolved, players may not identify which cards they played. The reason for these restrictions is to keep hidden information secret and to protect Cylon players from being discovered too easily. If a player has the ability to look at cards on the top of a deck, he may not disclose specific information about that card. Revealed Cylon players must also follow all rules of secrecy. They may not show their hands to other players and may not say which Super Crisis Card they have in their hands. On a revealed Cylon player's turn, he does not receive Skill Cards based on his skill set or draw Crisis Cards. He simply draws 2 cards, moves to any Cylon location, and then may use the action on it. The Cylon player may draw two Skill Cards of any type(s). The Cylon player may move to any other Cylon location. The Cylon player may perform the action listed on his current location. 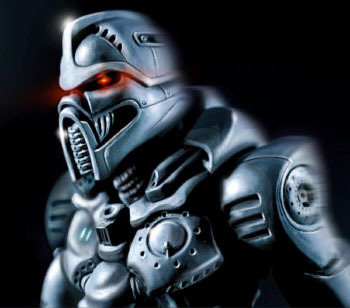 Revealed Cylons may not perform other actions, such as those found on Skill Cards or Quorum Cards. All of the abilities listed on a revealed Cylon player's character sheet are also ignored. Important Note: There are no "Activate Cylon Ship" and "Prepare for Jump" steps during a revealed Cylon player's turn. 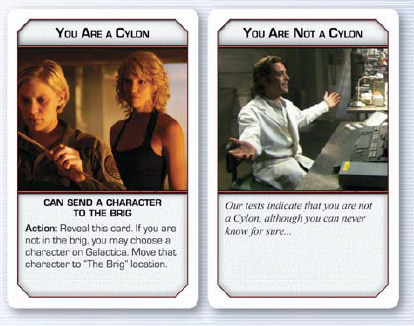 Although revealed Cylon players do not automatically draw a Crisis Card on their turn, they may draw and play a Crisis Card by using the "Caprica" Cylon location. When a revealed Cylon player draws a Crisis Card that poses a choice for the current player, that player makes the decision. Revealed Cylon players are unaffected by abilities on Crisis Cards and skill checks. They cannot be sent to the "Brig" or "Sickbay" locations, and cannot be forced to discard Skill Cards. Revealed Cylon players only draw two Skill Cards on their turns. A revealed Cylon player may - at his option - play one (and only one) Skill Card into each skill check that is resolved. Revealed Cylon players may not use actions or abilities listed on Skill Cards. They must continue to obey the hand limit rule, and discard down to 10 Skill Cards at the end of each player's turn. The Destiny deck is still used after a Cylon player has been revealed.